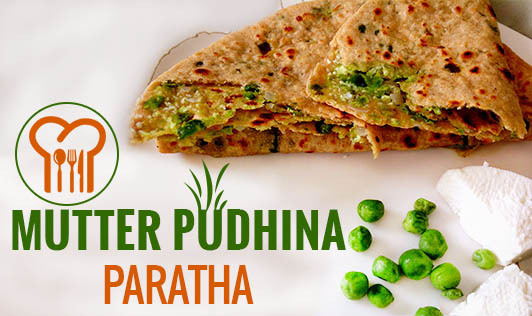 Made with pureed green peas, pudhina and whole wheat flour, these parathas make for a delicious, sustaining and wholesome meal. These parathas work best when served immediately after cooking. Green Chilies- 1to 2 nos. • Puree the green peas, pudhina, and green chillies in a blender. • Add the puree to wheat flour, mix all the ingredients, and knead into soft dough using enough water. • Divide the dough into 5 equal parts. • Roll out each portion into a small roti with the help of a little flour. • Heat a non-stick tava. • Cook the paratha on the non-stick pan, until it turns golden brown on both sides. • Apply a little oil on both sides and cook for a minute. • Serve hot with curd. • To make the parathas protein-rich, stuff with paneer.